"I highly recommend Hartbeeps to all Local Mums.�Hartbeeps is just genius. My eight month old son always has a blast and loves every minute of the class. The teacher is lovely and enthusiastic and there is no holding back on the�brilliant props the children are given to play with. We look forward to our Hartbeeps sessions, it’s the highlight of our week! Can't recommend highly enough." 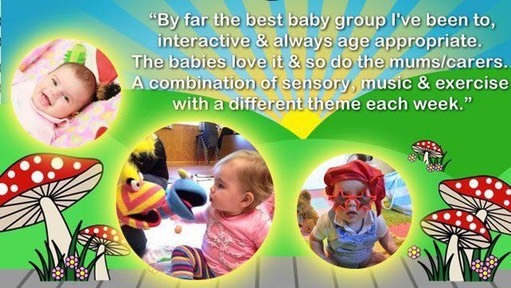 “I recommend�Hartbeeps�to Local Mums. It's engaging, entertaining and actually quite witty too. It's like the toddler class equivalent of a Dreamworks movie! The kids love it but it's fun for the adults too. I wouldn't be without this weekly class - I take both my girls now and we all absolutely love it." Come and try the magic of Hartbeeps yourself…. Since 2003 Hartbeeps has been delivering its unique blend of original music classes and mini productions to 1000's of babies and children. Challenging accepted definitions of 'baby and toddler' music classes; we create innovative, multi-sensory and highly interactive productions for the very young. By transforming everyday environments into colourful, tactile 'wonderlands' we invite our participants to join us in a world of the imagination. Using clever state of the art music production, original music composition, sound effects, songs and sound plays, lighting effects, innovative props and puppetry together with a vast array of multi-sensory techniques, we create original and highly specialised experiences for our young Hartbeepers. Launch event special price of �2 per child with all money going to Hartbeeps charity partner - The Children's Air Ambulance. If the session you'd like to attend is showing as 'FULL' please don't hesitate to email katie@hartbeeps.com to see if we have any planned absences or last minute cancellations.